you can now backup users files (encrypted). 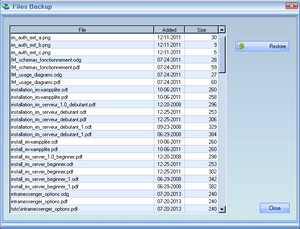 User set options folder (one or more) to backup. 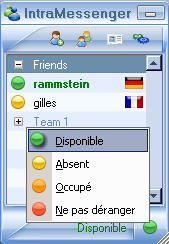 and then sended to server (with another FTP account from files sharing for more security). File named with the date, so many backup same day, only last one is stored. - _BACKUP_FILES_THIS_LOCAL_FOLDER_ONLY: backup this local folder only (empty: user choose). - _BACKUP_FILES_ALLOW_MULTI_FOLDERS: allow multi-folders backup. 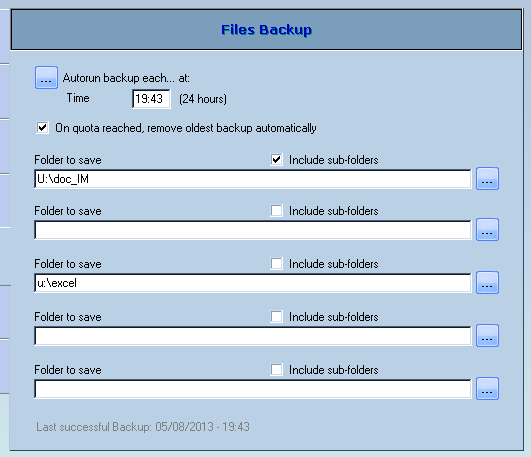 - _BACKUP_FILES_ALLOW_SUB_FOLDERS: Allow (or not) recursive backup (include sub-folders). - _BACKUP_FILES_MAX_NB_ARCHIVES_USER: Max backup/archives (dump) number stored per user (1 to 9). - _BACKUP_FILES_MAX_ARCHIVE_SIZE: Max archive/backup file size (MB). 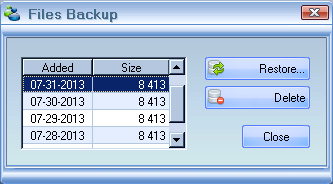 - _BACKUP_FILES_MAX_SPACE_SIZE_USER: Max backup archives storage space (MB) per user. - _BACKUP_FILES_MAX_SPACE_SIZE_TOTAL: Max backup archives storage space (MB).